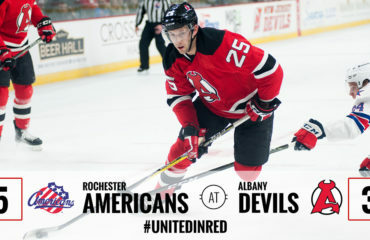 ROCHESTER, NY – The Albany Devils shot their way to a 2-1 victory over the Rochester Americans Friday night with goals from Yohann Auvitu and Vojtech Mozik. 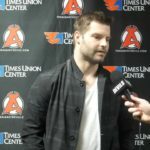 The Devils improve their record to 25-16-1-1 while the Americans move to 18-24-0-2. 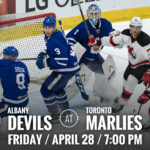 The Devils out shot the Americans 18-6 in the first frame but were only able to muster up one goal from Auvitu at 3:46 of the period when a pass from Joe Blandisi sent him in on a breakaway. 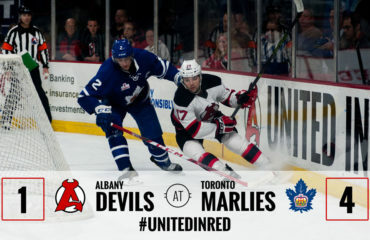 Brian Gibbons had the secondary assist on the goal. 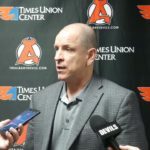 Rochester was able to tie the game under four minutes later at 7:23 of the first. 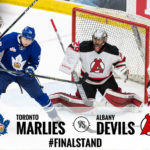 Tim Kennedy was able to force a turnover and beat Devils’ netminder Mackenzie Blackwood for an unassisted goal. 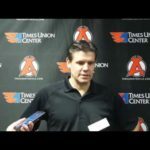 Early in the second period Albany was able to take advantage of a power play when Rochester’s Tyson Strachon went to the box for slashing. Mozik found the back of the net with a shot from the point at 3:47 of the period. Jacob MacDonald and Blandisi earned the assists on the tally. 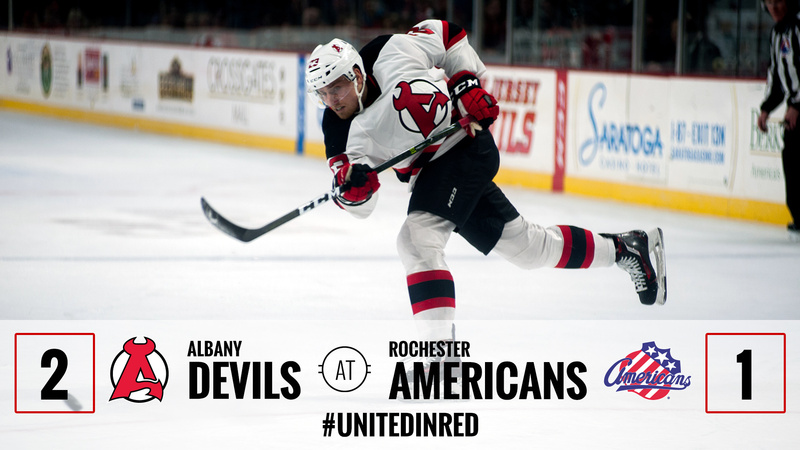 Max Novak’s tripping penalty at the 12:00 mark of the second and Nick Lappin’s interference penalty at 14:45 gave Rochester back to back power plays but the Devils were able to kill them both off keeping the score at 2-1 through two periods. Rochester was able to get some chances in the third period but Blackwood turned them all away to secure the win for the Devils. 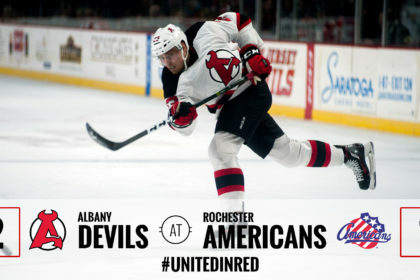 Rochester goaltender Linus Ullmark stopped 34 of the 36 shots as Devils outshot the Americans 36-19. Blackwood stopped 18 of 19 shots. 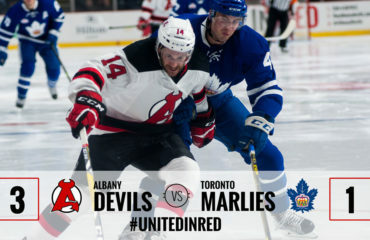 The two teams will travel to Albany for the second half of their home and home tomorrow, at 5 pm.